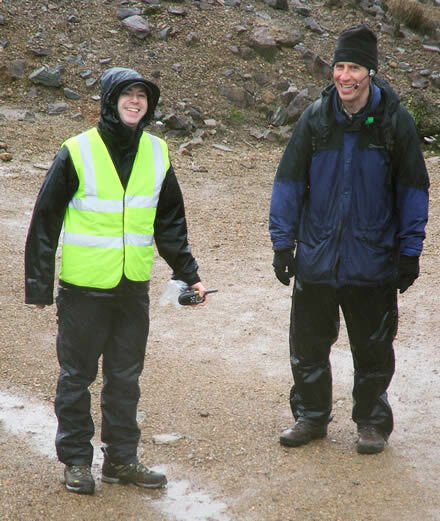 I visited Devon Great Consuls (near Tavistock, Devon) today with Dr John Maskall (University of Plymouth), Dr Trevor Collins (Open University/Knowledge Media Institute, JISC Portable VoWLAN project) and John Lea (JISC Portable VoWLAN project Consultant). This project is linked to the ERA (Enabling Remote Activity) project. More details about the Consuls can be found on the virtual tour. One of these PCs is used as a server, and the other two as clients. Both clients are used to communicate between the based server (in this case, one in the Land Rover). 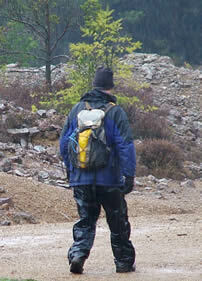 The 'roaming client PC' (Photo left: rucksack on John Maskall's back) communicates voice, and in addition digital photographs and video to the other user in the Land Rover. For the techys reading this, there are more details on the equipment and software used on the ERA wiki! What struck John M and I immediately was how smooth the video and clear the voice communication was. 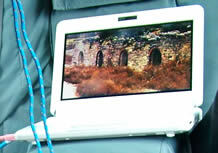 (Photo right: video showing an Asus Eee PC - network cables dangling) The only real issues on this day were the occasional WiFi blind spot and keeping the lens free from rain! But this is exactly why its important to field test technology so we could iron out the bugs and improve for future deployment. 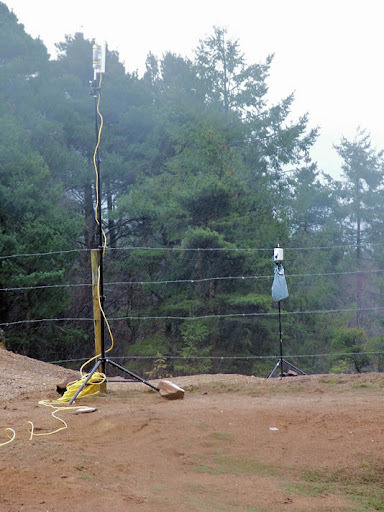 The antenna is shown on the far left (Photo left) with an additional fixed WiFi IP camera on the right (Photo left) which was displaying the whole of the consuls continuously. The blue bag actually contains the battery. 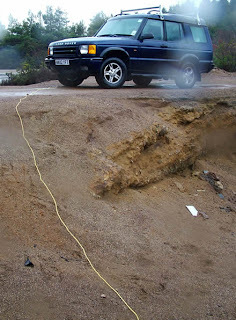 Note that the yellow cable is the one trailing to the Land Rover which of course connects to the server within. This antenna is the main communication link with the roaming unit (in this case John Maskall) No pun intended John... Considering that the main equipment is predominantly home WiFi equipment, it was extremely effective. John Maskall was able to talk about the site while showing video, and I was able to also ask John to look at or describe specific items on the site as he roamed. I think you can start to see the benefits of such a setup. I should explain that the Google 'My Map' above shows the areas in which we tested the unit (red lines) and the points are merely points of interest. Point 15 (blue flag) is where the antenna was located. The little blue truck is where the Land Rover was placed. You will need to zoom ('+') on the map near the very top points to view the icons clearly. All in all an excellent day in the field, many thanks to Trevor and John Lea for making this a successful day and letting John Maskall and I really test the equipment to its full! Trevor has posted more photos and a video on his blog. Ecosystems fieldcourse website goes live! The TEL Teams first newsletter!